Download Spiral Notebook Mockup PSD. This is another Top view notebook mockup which is ideal to showcasing your spiral notebook design and branding in beautiful and unique manner. 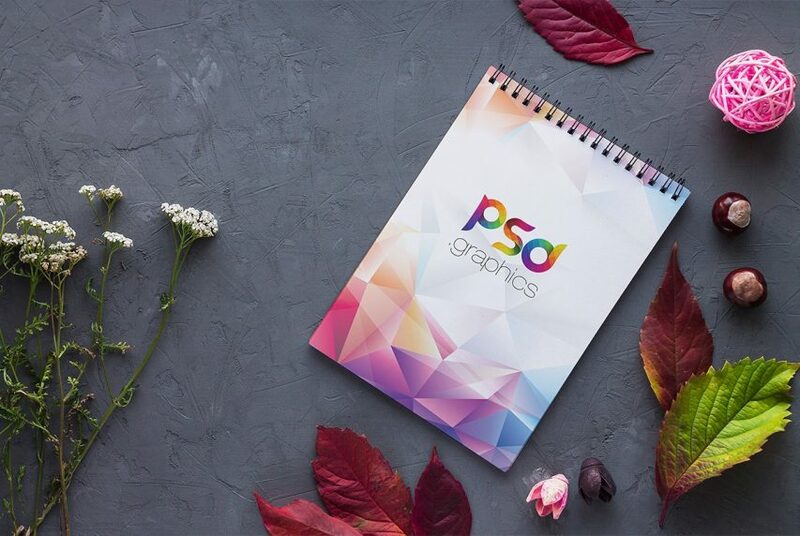 The mockup scene shows a spiral notebook on a concrete floor along with autumn leaves, flowers and other element which give this spiral notebook mockup a unique and beautiful look. You can replace the notebook design easily using smart objects. This Spiral Notebook Mockup can be really useful for designers who wants to showcase notebook design to client or selling notebook online. Spiral Notebook Mockup PSD is created to help you display your graphic design projects in photorealistic way. So if you are looking for perfect mockup for showcasing your notebook design than this free mockup template is all you need to get the great result and impress your clients. This Spiral Notebook Mockup file uses the Smart-Object feature, so you can replace the mockup content easily and quickly. You just need to double-click the Smart-Object, paste your artwork, save, and you’re done. If you like you can download and use this Spiral Notebook Mockup freely. Anyway, hope you guys enjoy it and i hope this will help you benefit your project as well. Do not forget to Share if you found this helpful. All in all this Spiral Notebook Mockup PSD has a modern and elegant look. This layered PSD resources comes with Easy & customizable PSD file arranged in groups and named perfectly which can save the time to create your own mockup. You can modify this Spiral Notebook Mockup PSD. However you are free to use this Free PSD in your personal and commercial projects. If you are using this file please give some credits to psd.graphics Hope you like it. Enjoy!